So the other day I saw a post on tumblr about a new myu, I remember havng heard about it a while back but this was some concrete news! Here's the original post. Then today on the Sailormoon-official.com website they announce the new inners! I posted about it on our tumblr with a terrible google translate of the stuff but ainomessage on tumblr has posted a better translation so here it is. Nice to meet you. I’m Nomoto Hotaru and I’ll be playing Sailor Moon/Tsukino Usagi. I’ve been nervous for days leading up to the announcement, it already feels like my heart is going to jump out of my chest. I never even dreamed that I’d be playing Sailor Moon. Until I can wear the Guardian costume and appear in front of you all, I won’t feel like it’s real. I’ll do my best so that we can live up to the history of Sera Myu and to bring you a wonderful performance with the other Guardians. I’m going to work my hardest to bring you an amazing and lovable Usagi, so please give me your support! Nice to meet you. I’m Kuroki Hikari and I’ll be playing Sailor Mercury/Mizuno Ami. This is my first time appearing in a play or musical, so I’m really excited. Mizuno Ami is a refined and kind person, a little ditzy but very intelligent, the kind of girl anyone would look up to…I don’t think I’m much like her, but I’m going to work hard to become as close to Ami as I can! I’m nervous, but I’m going to do my best to become the Mizuno Ami you all know so please give me your support! I’m Kobayashi Karen, playing Sailor Mars/Hino Rei. Sera Myu is stage show loved by many people. The same is true of the 5 actresses who played the 5 Sailor Guardians up until now. I actually went to the show last year and really felt the strength of the bonds between those 5 girls, and really wanted to act in a play as moving as this! When it was decided that I would be in the next show, I was so happy I broke down in tears. I’m going to give my all to become more and more like Hino Rei, to fall in love with my companions, and to bring you a play overflowing with love and friendship! Please give me your support! Nice to meet you. I’m Kaede and I will be playing the role of Sailor Jupiter/Kino Makoto. When I was little, my brother and I played Sailor Moon games together. When I set out to be an actress, my ultimate goal was to be in Sera Myu. I’m very happy to be able to take part in this show. The manga, the anime, the musicals… there are so many fans that treasure Sailor Moon, so above all! I want to treasure this role. Using the experiences I’ve gained from my work as a model, I’ll do my best to show you a feminine, cool Jupiter! I’m Hasegawa Rimo and I’m playing Sailor Venus/Aino Minako. It is a great privilege to star in a series that has been running since before I was born. There are manga fans, anime fans, and Sera Myu fans - many people who love Sailor Moon, and to jump into a series with such a long history makes me excited and nervous. I’ll do my absolute best to portray Minako, who is both a normal girl who wants to be an idol and the brave leader of the 5 Guardians. The musicals exist because you all keep coming to the theater, and I want to create a dream show along with all of the Sailor Moon fans around the world. Please come to see us at the theater. The dates have also been announced! This time the show will have performances in a third location, Fukuoka! The official site says more details coming soon! I'm excited. These girls all look lovely. Moons actress reminds me of Mariina. I can't wait to see more news and costume development. I hope they all sing well. I'm hoping to see some slight changes from the past myu, time will tell. I'm getting this Japanese Idol-like vibe from them. Their looks give me that vibe specifically. I'm hoping these girls will give that vibe to the senshi to give them life and they have good voices. Super excited to see the costumes! Let's wait for more info to come this fall. They're all beautiful. I can't wait. I'm really torn because I've come to adore the other group of inners so so much (I really love Un Nouveau Voyage), but these girls look so cute and I can see them working well. Their faces look like how I would expect the characters to look! xD I was so sad to say goodbye to the first group, but I am ready to love this group just as much! Excited! I can feel Mars' sass from here. I saw this post on tumblr also! I'm pretty sure it's gonna cover supers, since they've been doing the arcs in order. Yeah, I mentioned that in the OP. Since the musicals have been following the manga arcs and coinciding with Crystal to some degree (in the sense that generally if a next arc musical was announced, we got that arc in Crystal), it seems apparent its going to be the Dream Arc. This is going to be another tough one for me because the original SuperS musicals are two of my personal favorite shows and very hard to beat, much like how Black Lady was with Petite Etrangere. The cast seems to be a bunch of newbies, which is fine because thats almost how it always was in the old myu too, so I'm curious to see how they do. The girl playing Moon kinda reminds me of Anza and Marina a bit. Yay, a new musical! I'm so excited! I'll definitely miss the other group of inners, but this new group also looks really good. They're all so beautiful, and they also really look like their characters! I really hope they all sing well, especially the new Usagi. I loved Satomi and thought she was a great Usagi, but her singing definitely was not her strong point (thought she did get better over time). Can't wait to see their performance! I'm still not sold on them at all. I agree with brit, but Jupiter's actress, she totally says Jupiter to me. Moon is too cute. I want more images. The outers are in the Dream Arc of the manga? o.o They weren't in SuperS in the anime. Ah gotcha. It's been awhile since i have read the manga. Thanks for clarifying bubbles. So they're following more of the anime or manga with this? No outers? I wouldn't say that just yet. Since the Inner Senshi cast are going to be new I think the organizers of the Myu are giving them more publicity. I'd say give it more time; if the Outers are returning then I'd expect they'll be announced at some point before the promo poster comes out. They've been following manga up til now, it would seem odd if they suddenly switch to anime. Yeah, these new musicals have been manga based and i think somewhat correlate to Crystal (IE whenever a new musical arc was announced, it was usually confirmed not long after we were getting that arc with Crystal). Since the outers show up for the last part of Dream in the manga, they will most likely be there. Basically they are the bomb. Ah well, this is getting a bit off topic so I'll post my site but I would like to ask everyone to keep on topic with this being about the New Musical coming out. I thought I had read the 30th. Cause Usagi's Bday and all that. I think theres a Nico event?? Someone correct me if I'm wrong. I know I read on the official site they were supposed to show the girls in costume this week, but somethng came up. 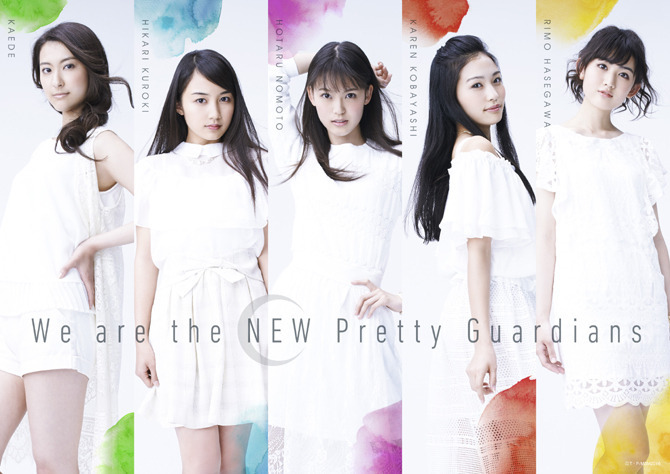 To be honest it would make sense for them to "debut" at the niconico event. If we are really lucky, maybe we will get a song. I have seen these girls getting excited for their roles through different accounts on tumblr and twitter. Still not passing judgment on them until I see them perform. 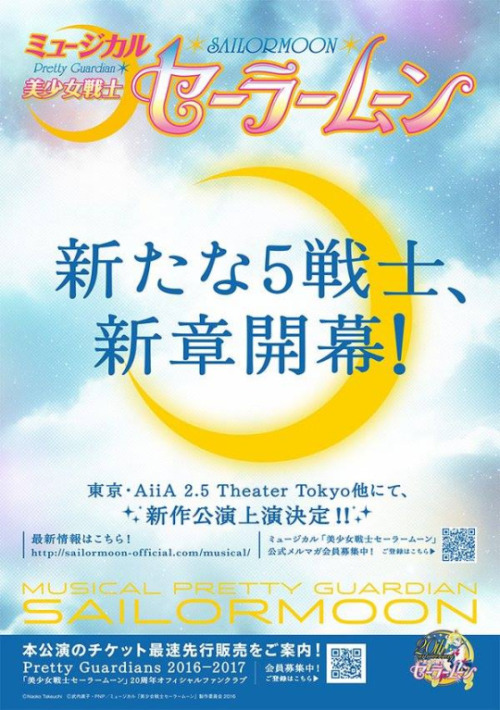 Cast list for the four musical, titled "Amour Eternal" has been released! The characters appearing in this musical include not only Sailor Moon, Chibi Moon, Tuxedo Mask, the Inner and Outer Senshi, but also Nehellenia, Zirconia, Helios, Tiger's Eye, Fish's Eye, Hawk's Eye, and six Dead Moon Circus members (donno if these are the Amazon Quartet; their roles literately say "Dead Moon Circus member", plus there's six, not four of them, so they might be lemures?). Also interesting to note that there's only one actress listed this time for the role of Chibi Usa/Chibi Moon, so we're probably going to see an older Chibi Usa this time i.e. someone who isn't so young that they'd have to split the acting time so as to not violate Japanese labor laws. I think this is probably also a good thing if the myu is to focus at all on Chibi Usa and Helios' relationship, as having two different actors play the same role might make it harder to develop a consistent on-stage chemistry with another actor (or more likely, actress, given the recent Myu's track record of all female cast). I'm excited to see what the cast in costume looks like!